The pears arrived, hard as meteorites, risking dental appointments for the children. A few days later, after sitting in a bowl, one had turned to a mould-spotted mush and the others were looking suspicious. Never mind. A little scraping and carving here and there rendered them perfect for a tart, and a few eggs, some flour and sugar mixed with almond syrup and butter later, I was pouring the mixture into a prepared puff pastry case. 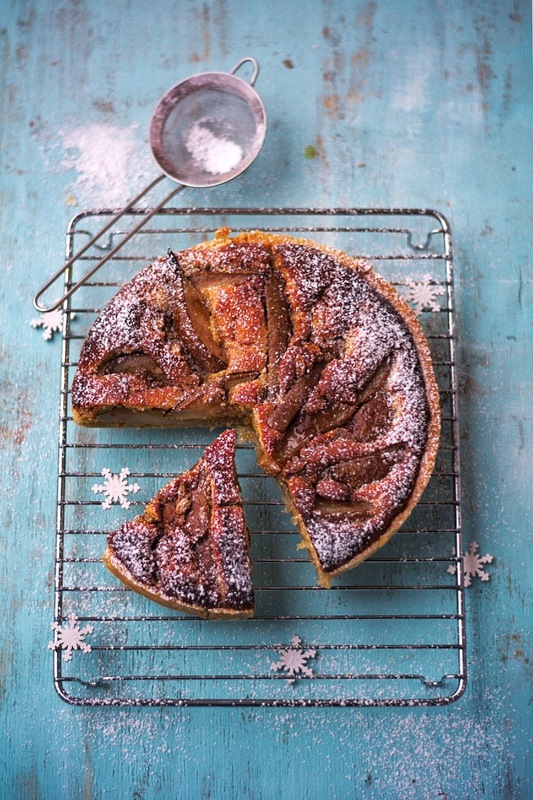 The classic pear tart, or even the frangipane version will keep and make me very happy. This combined the two, more really down to me wanting to use up ingredients that needed using than by design. And the result was simple, fairly quick, and definitely very tasty. Finish off with toasted and flaked almonds if you like. I didn’t because I forgot. Heat the oven to 180c, gas mark 5. Heat a pan and add the pears. Throw in a good amount of butter and about a handful of sugar getting the pears well covered and add in the cardamom . Cook on a fairly high heat for about five minutes, until they’re nicely caramelised. Grease and flour a 20cm tin then line it with the pastry. Line that with baking parchment and fill with baking beans and blind bake for 15 minutes. Remove from the oven, take out the beans and paper and trim the pastry edge. Poke the base all over with a fork and put back in the oven for ten minutes, turning once to keep the cooking even. Remove from the oven while you make the filling. In a large bowl, cream together the butter and sugar then mix in the eggs. Beat until combined then slowly add the flour, mixing well until fully combined. Add in the syrup and butter and mix well. Fill the tart case and place the pears on top. Bake in the oven for twenty minutes, then turn once and bake for a further fifteen minutes until the cake is set but still moist. Leave to cool a little and dust with icing sugar. This is best eaten slightly warm.